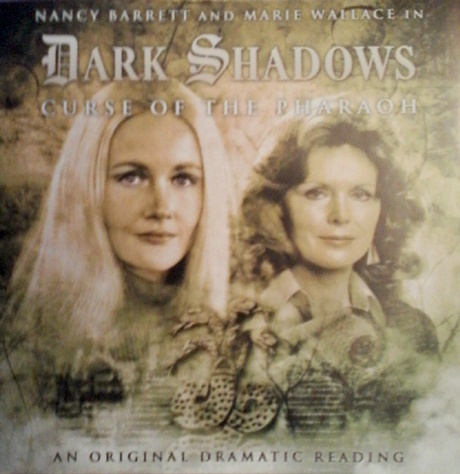 In my review of the final episodes of Dark Shadows, I mentioned a feature on the last DVD where one of the show’s writers foretold a future for Carolyn in occult research; I said I would love to watch a spin-off series based on that premise. Although this story doesn’t follow that idea exactly, it seemed to be along similar lines. Also, I’d just listened to the Dark Adventure Radio Theatre play Imprisoned with the Pharaohs to prepare for writing that review, and I thought I’d like to hear another story about an evil ancient Egyptian ruler with a cult that survives into modern times. As it turns out, the story does have its own Lovecraftian overtones. It was amusing to me that this story begins with Carolyn looking over “strange, alien” hieroglyphics and declaring that “It makes no sense!” just as Nathaniel Ward did. Carolyn, however, is not in a deep and long-forgotten tomb in Egypt, but in her own home at Collinwood. She is making subtle changes to the hieroglyphs as transcribed in the notes of some person as yet unnamed, and is terrified that that person will come in and discover her before she finishes. This opening scene is a teaser. Most of what follows is Carolyn’s account of the events that led up to this act of archeological sabotage. It all begins when Dr. Gretchen Warwick shows up at Collinwood, introducing herself as “the famed Egyptologist” as well as an old friend of Professor Stokes. Her claim to fame is the discovery of the tomb of Nefarin-Ka along with her late husband. Nefarin-Ka was a “forgotten” Pharaoh, she explains to Carolyn. His name was stricken off all monuments and records after the end of his tyrannous reign and his body buried in a tomb with no markers to indicate its location. He was reviled, and eventually overthrown, for worshiping “different gods”. The site of Nefarin-Ka’s tomb was Herbert Warwick’s obsession, but Gretchen didn’t make her important discovery until after her husband’s death. She’s come to the also-widowed Carolyn claiming that Carolyn is the one person who can help her. Carolyn says she knows next to nothing about ancient Egypt, but Gretchen Warwick assures her that she does have important “knowledge”. Dr. Warwick is self-assured to the point of obnoxious arrogance, and Carolyn has doubts about everything she has to say (“Are there actually that many famed Egyptologists?” Carolyn snidely wonders to herself). She’s about to show her visitor out, when Elizabeth Stoddard invites Dr. Warwick to stay at Collinwood. Dr. Warwick installs herself in one of the many guest rooms and redecorates with a number of priceless Egyptian artifacts that would be better off in a museum. One object, which Carolyn sees with horror, is a little gold box that bears a symbol of a multi-headed snake–the Naga, a creature without a soul, that featured so prominently in the Leviathan storyline. Even in Nefarin-Ka’s day, says Gretchen, the symbol of the Naga was ancient. It has appeared in many cultures the world over. It holds power. To Carolyn, it’s a symbol of death. Carolyn’s late husband, Jeb Hawkes, was one of the Leviathans and not human to begin with; his Heavy Breathing spirit originated within a similar carved wooden box which one of the Leviathan cultists gave to Barnabas Collins in the 1790s. Carolyn is unaware of all this, including the facts the Leviathans intended to transform her into a monster like Jeb as part of their wedding ceremony, and that Jeb killed her father while in his Heavy Breather monster form when Paul Stoddard balked at giving her away. She only knows that Jeb was somehow involved with the cult and died because he broke with them. She’s still grieving for both her father and husband. I’m not sure how long after the end of the series this story takes place. Elizabeth Stoddard, Roger Collins, and Professor Stokes are still alive, although Elizabeth is the only one who’s currently in the vicinity of Collinwood. Carolyn’s cousin David is also said to have gone away to continue his studies, which could mean that the family finally sent him off to school, or that he’s now at a university. Mid-1970s seems a good estimate. Dr. Warwick’s idea is that she and Carolyn use the Naga box to restore “everything we hold dear”–that is, their respective husbands. She’s copied certain hieroglyphics found in Nefarin-Ka’s tomb and is translating them to decipher the incantations to bring this about. Her husband experimented with these incantations too soon, and it went horribly wrong. He was taken prisoner by the Leviathans “on the other side of death,” where they exist. Proper use of the Naga box’s power will bring back the people the Leviathans have taken, such as Herbert Warwick and Jeb Hawkes. The ritual requires two people, which is why she needs Carolyn’s assistance. Still in pain over her very brief marriage and its tragic end that she still doesn’t fully understand, Carolyn agrees to participate. Besides, since the famous Egyptologist’s arrival at Collinwood, Carolyn has been having strange dreams and visions about ancient Egypt in which she’s the consort of a cruel and ambitious Pharaoh who has abandoned the old gods and is trying to introduce a new religion–why, it’s the same Nefarin-Ka whom the Warwicks have dug up! There’s a “faceless horror” he keeps in the temple to sacrifice his enemies to, and which he threatens to sic on his wife if she tries to intervene in his daily acts of bloodshed and tyranny. It may all be a matter of suggestion, but it’s compelling enough for Carolyn to believe there’s a deeper connection. The two women enact the ritual, similar to a seance, in the archeologist’s antiquities-crowded room. Dr. Warwick recites an incantation from the hieroglyphics. Carolyn thinks she sense Jeb’s presence, hears his voice calling her name. Although she’s been warned by Gretchen to remain silent no matter what happens, lest they draw the attention of the Leviathans, she calls out to him response. That ends the ritual abruptly. Dr. Warwick tells Carolyn that by speaking, she may have roused something dangerous. Carolyn visits the Blue Whale in town later that evening. The jukebox still plays the same generic surfer-music it has since Carolyn first danced there with Joe Haskell in 1966. She sits at a table by herself, as she usually does. While she’s thinking about old times and old boyfriends, she spots local lawyer Mike Garner, brother of Victoria Winter’s long ago sort-of boyfriend Frank; Carolyn recalls this relationship and says that “nothing ever came of” it. Mike comes over to chat with Carolyn and leaves the bar near the waterfront just after she does. When Carolyn hears a scream and splash behind her, she turns to see that Mike has disappeared. There’s something in the water, and a slimy, sulfurous substance on the docks which she slips in when she runs back to see what happened. She just glimpses something monstrous in the darkness before she passes out. The next morning, Sheriff George Patterson questions Carolyn about the last time she saw Mike. He’s been found in the water, horribly mutilated. Carolyn herself isn’t suspected–it looks like Mike fell into the water and something got him. Sheriff Patterson’s seen too much weirdness around Collinsport himself the last few years to speculate about what kind of creature it might’ve been. Carolyn, convinced that Mike’s death has to do with the interrupted ritual, intends to tell Gretchen Warwick that she refuses to go any further with this Naga-box business. Outside Gretchen’s room, she thinks she hears the archeologist conversing with someone–a man’s voice. The voices are low and murmured, but it sounds like they’re discussing preparing for something that will happen tomorrow night. When Carolyn asks, Gretchen explains that she was listening to her husband’s old notes on her tape recorder. Look, the tape recorder’s right there. She dismisses Carolyn’s fears about the connection between what they’re doing and what happened to Mike Garner. She’s determined to go on. When Carolyn insists, Gretchen suddenly turns from merely obnoxious to distinctly terrifying. She tells Carolyn that they will continue tomorrow night, or else she will cut out Carolyn’s mother’s heart and feed it to that faceless beast that’s been haunting Carolyn’s dreams. Oh yes, she knows all about Carolyn’s dreams. And, after Elizabeth, she’ll kill Uncle Roger, Cousin David, and so on. What a surprise: Gretchen is one of the Leviathans. She joined them in exchange for the restoration of her husband. Once her plans are fulfilled, she also looks forward to “walking the barren Earth as a goddess,” which doesn’t sound like much fun to me, but it does recall Wilbur Whateley from The Dunwich Horror writing about the places he intends to travel to “once the Earth has been cleared”. More than that: the Leviathans haven’t forgotten the bargain Paul Stoddard made with them many years ago before he abandoned his family at Collinwood. He thought when he gave up his “most precious possession” in exchange for wealth and success, he was handing over his soul. At the beginning of the Leviathan storyline, he learned that what he gave up to them was his daughter. Earlier, when Carolyn and Gretchen were talking about Paul’s death and how similar it was to Mike’s, Gretchen used this same phrase, “his most precious possession,” to refer to Carolyn. Carolyn’s marriage to Jeb Hawkes didn’t turn out as the Leviathans planned in 1969, but they still want to claim her as of their own. With her family threatened, Carolyn has no choice but to participate in the next night’s ritual, but she has one tactic at her disposal. She can make some slight alterations to the hieroglyphs in the archeologist’s notes so that when they recite the incantations, things are bound to go wrong. She’s been sensing Jeb’s presence around the house since that first ritual and believes he’s guiding the changes she makes. But will it be enough to put a stop to Dr. Warwick’s plans? This is where we came in. This is my first experience of a dramatic reading. I think the style works as long as the focus is on Carolyn Stoddard’s narrative or monologues, or on conversations between the two main characters. Where it doesn’t work as well are scenes where Nancy Barrett has to do other characters’ voices besides Carolyn’s–Elizabeth’s, Mike’s, Jeb’s. It’s somewhat jarring to the story when Elizabeth comes into the drawing room and sounds exactly the same as her daughter, or when Mike starts to chat up Carolyn at the Blue Whale and it’s sometimes difficult to follow which character is saying what. Barrett does better when Carolyn makes a patchy international phone call to Professor Stokes in Cairo; she doesn’t sound like him either, but gives a decent impression of his pompous style of speech over the crackling phone line. It’s a pretty good story, continuing one of the more macabre plotlines from the original series. The Leviathan storyline was the show’s writers’ tribute to Lovecraft, although it doesn’t reflect any particular short story of his as they sometimes- er- borrowed plot points from other works of gothic and horror fiction such as Rebecca, Jane Eyre, Dracula, or Dr. Jekyll and Mr. Hyde. Carolyn’s narrative also uses several nice little call-backs to other Dark Shadows plots and minor characters who don’t enter into this story but would have been part of her memories. For my tastes, there’s too much sentimentalizing whenever Carolyn senses Jeb’s spirit, but I suppose that would only be natural for her, as a young woman still dealing with grief over the loss of her husband and missing him physically. There’s not a lot of use of sound beyond the voices, but I noted a few nice touches. That jukebox music evokes the Blue Whale as effectively as Carolyn’s memories. And there’s a good use of reverb on Marie Wallace’s voice when Dr. Warwick goes all evil when the sabotaged hieroglyphics are put to use and backfire. The cry of seagulls and waves calls up images of the seas crashing onto the cliffs near Collinwood. Carolyn’s story ends at Widow’s Hill, on a note that recalls the fate of the shining trapezohedron in another Lovecraft story, The Haunter of the Dark, as well as that of the Templar’s tin whistle in M.R. James’s O Whistle and I’ll Come to You, My Lad. She takes the little gold Naga box and flings it off the cliffs into the ocean, in hopes that it will never be seen again. The North Atlantic must be the repository for any number of evil objects that can wash back up on innocent shores at any time.